Hello guys! Why did you like this piece of crap? What's there to like?? Is it the line that gave you the impression that the ride wasn't a waste of time? I mean, on the day I was at the park, the wait was non-existent! I walked through the line, got in, and here I went! I felt NO airtime and NO intensity: I was just being pushed back and forth, knocking my back each time against the seat and it just wasn't intense, thrilling, funny, or entertaining, IT WAS JUST PLAIN ANNOYING!!!!!!! Man, did I wish that line was longer. That would've spared me from so much pain. I went on expecting a kiddie ride and I got a really intense ride. The Gs were incredible on the swings, but it was a tad rough and it was way too short. this ride was short and knocked the wind out of me on several occurances. I liked the ride Im just not sure why it hurt. There are those rides that really aren’t anything special, yet nothing all that flagrant, but they ultimately are lackluster in comparison to the rest of the park and really don’t merit much attention. However, there are some that I just feel compelled or obliged to ride every time I pass by for whatever reason. Buzzsaw just happens to be one of those rides and all in all, it’s a mixed bag of an attraction. Located in the South End and surrounded by some dense timber, Buzzsaw fits it flawlessly with the section. Not only does it in terms of placement, but the ride itself looks great with its woodsy paint job and neat designs on the sides that make the attraction look even more amazing. 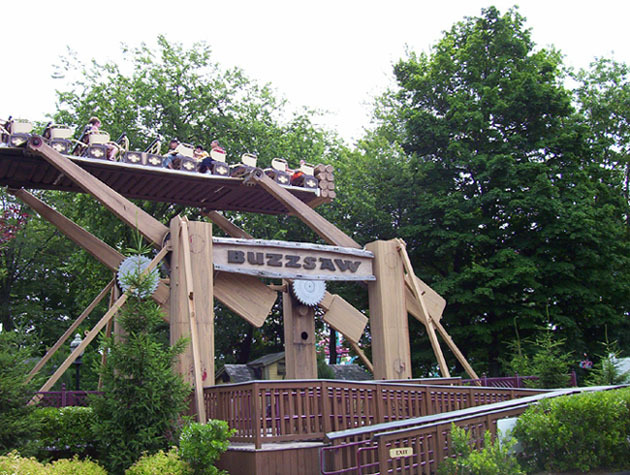 Being one of the few original Riverside attractions still remaining, Buzzsaw typically doesn’t ever have much of a wait. The longest I’ve waited was one cycle, and that was on an exceptionally busy weekend a year or two ago. Also, the ops really don’t mess around in loading this thing and it may arguably have one of the fastest loading procedures of any ride in the entire park. One final note, as with all pendulum rides, the ends are the best seats, but they aren’t worth waiting extra for. Once seated in one of the many benches, a simple lap bar restraint comes down to restrain riders. Oh yeah, and make sure you hold onto the bar in front of you or else you will be slammed and thrown into the restraint with no mercy at all. Buzzsaw may look innocent, but it’s an intense little flat with teeth. The rotations are all taken at breakneck speeds to induce some great tummy-tickling sensations and powerful positive Gs, but they may in fact be too strong as the forward and backward slamming is definitely a deterrent. Lastly, the park just runs a mediocre cycle on this with about 2 whole rotations that lasts barely 30-45 seconds. Buzzsaw is a really intense flat, but it may in fact be too intense for its own good as the abrupt changes in direction can be quite uncomfortable and borderline painful if you ever forget to hold onto the provided bar in front of you. That being said, I honestly prefer flying carpets that move laterally and are teeming with laterals such as Huss Rainbows or even Wisdom Moby Dicks. Still, Buzzsaw is a powerful, little flat worth checking out if time allots it since very few flats out there are capable of matching the powerful forces this one provides. This ride is quite intense. It was like bull riding in terms of the way your back gets snapped around. It would be better if it had a longer cycle, though. One of the best flat rides Ive ridden. Its small, but it packs a punch. The one real complaint I have is that SFNE always runs an extremely short cycle.